Autonomous education is something that I believe in passionately. Yet, I still find it hard to live by. Autonomous education for me is a constant battle to keep my mouth shut. It is a constant battle to let my kids learn, instead of turning their every interest into a teaching opportunity. It is hard because, as a parent, my confidence is being constantly undermined by those who are supposed to be professionals. The education professionals and schools blame the parents if a child "fails" and take the credit if a child "succeeds." Having the confidence to let your children learn and grow and find their own motivation is quite hard, especially when it seems that everybody in society is looking for somebody to blame for the problems concerning our children. There have been times when I feel that we are accomplishing nothing and so I pull out the workbooks and flashcards and start teaching. I always meet resistance and we end up having a fight. The real problem has been that I have been too tired or that I haven't been doing anything for myself. I am doing things for myself now. I am taking a couple of evening courses and the kids are fine. They see me enjoying things, enjoying learning, and they share it with me, especially the African drumming. Gaining knowledge, experience, learning are all a part of being human. It is not something that is imparted to you as you grow from childhood. That is the problem that a lot of adults have. They bought the crap that they were given at school about adults knowing it all. Now they are adults and they think something is wrong with them because they don't know it all. Giving my kids the space they need to learn is hard, too, because I am doing this basically on my own. I have 2 or 3 good friends who share similar beliefs but they do not all live near me. The people that I have day to day contact with are those who are constantly asking, "How's the home teaching going?" No matter how many times I answer, "Fine" and change the subject or simply state, "It's just the way we live" I keep hearing it. I keep hearing about SATS and 3 year olds starting nursery and how my children need more socialization and how brave I must be and how other parents couldn't do it and what about GCSE's and don't I need more time to myself and what other children are achieving (ie being awarded) and what key stage are we working to? I feel as though I am constantly competing in a race that I never entered. Sometimes, I want my kids to be the best at everything just so I can tell these people where to go. But that isn't why I am home educating. I have to keep reminding myself that I am doing this because it is what I believe is best for my children's personal as well as academic development. I suppose it is getting easier. As they grow and show me all that they are capable of, I get more confident -- confident enough to leave them alone and just be there, just watch. I've watched my eldest learn how to read, months after her friends at school were being- taught- to - read - like- this- with- a- finger- under each- word. I watched her as she listened to one friend read her a reading scheme book in this way and say, "Wow, you're reading good" only to be answered with, "But you can't read yet." Six months later, it clicked for her. She just picked up a book and read it to a family friend. ( I think I was more proud of how she dealt with the snooty friend than of her reading.) That was my first lesson in how to trust my children in their own learning. Every few months something wonderful will happen that will give me the energy to carry on. Somebody will get excited about a project on the Vikings or answer a question about Japan saying, "That was on the Simpsons." Then there was the day that my eldest watched a BBC Primary science television program about the body. She wanted to know more about the body so we used the computer to look at pictures of skeletons and the cranium and the brain, which, because she thought of her baby brother and his fontanelle, led to a discussion about how our bodies grow, which led to us getting out loads of photographs of various family members as babies and as adults, which led to a talk about America, where my mother lives and where my daughter was born, which, because we had a car while we lived in America, led to a brief discussion about cars and their impact on the environment. We talked about what it was like when I was a baby, and when Grandma was a baby. The whole thing ended up with her making a Body Book with loads of photographs which she wanted to sort out in chronological order. 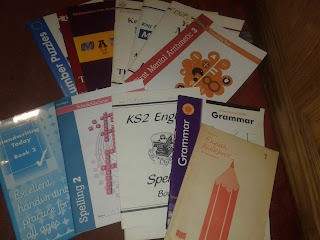 If I were following the National Curriculum, I could have recorded that we covered Technology, Science, Geography, History, Maths, and English. We had something tangible, the Body Book, at the end of the day to show everybody what we are doing. This was a "successful day." Autonomous Education is vindicated! However, autonomous education for my second daughter is quite different. Another time, while watching something on one of the educational programs (which they chose to watch, by the way,) I decided to explain something to her. I didn't get very far before being silenced by her shouting, "DON'T TEACH ME!!!!" Again I find myself fighting to keep my mouth shut. I realize that my goal as a parent is not to have something tangible at the end of the day, or the term, or the year. My goal is to raise children who know what they want to do, because they've been able to try things: children who know how to do what they want, because they've been able to figure it out for themselves; children who are happy most of the time, but know how to deal with Life when they're not. I hope that my children will be capable of autonomy in many aspects of life. I also hope that they (we) never stop learning.